Happy 4th of July! I hope those of you celebrating have something fun planned and I hope the weather is good for your celebrations! This is the second time in my life I'll be celebrating in Ireland where Sweet Home Alabama typically gets played at a pub in acknowledgement. Haha! Have fun and stay safe! I've been wanting a kimono for at least a year now, but although I kept seeing cute ones on other bloggers, could never find one with a good print and colors to purchase myself. They make such nice layers, especially in summer and can add so much color and interest to outfits. They are especially nice as part of a maternity wardrobe to help mix up what would otherwise be a very plain outfit. I finally found the perfect one at an amazing price on Sammydress. Unfortunately it's sold out, but there are many other cute ones available here. I felt so put together in this outfit and even had a couple strangers compliment me! And it really was just a white tank top, jeans, and a kimono! It's always fascinating to me how much one piece can complete an outfit! Happy Fourth of July! This kimono looks fabulous on you! I currently don't own one, but it's definitely a style I would love to try. I love this kimono! The print is so pretty and I adore the tassels. Have fun at the pub and happy 4th! Happy 4th of July! I love this pretty kimono, great look! Great Kimono look! Happy 4th! Fabulous kimono look! The yellow is so pretty. Great kimono Laura, looks marvelous on you! Sweet Home Alabama in a pub in Ireland, huh? Sounds like a fun way to celebrate the 4th! Enjoy! Too cute! I can't believe this is your first kimono. You know, the last time I wore a kimono is was just with a white tee shirt and jeans and I got a lot of compliments on it too! Ireland? Wow! That's amazing! That's a beautiful kimono, I can see why it got a lot of compliments - kimonos are the best finishing pieces for an outfit, I'm sad I can't wear mine while it's winter, it's too chilly for bare arms! Also how full and beautiful your hair looks here - you're definitely getting that lovely pregnancy hair! Hope you are having a lovely start to the week and you have a fun time celebrating 4th July in Ireland! Laura, I am loving this kimono! I have a bit of a kimono addiction and haven't really seen a kimono that I don't love. My problem is trying to not buy all of them! I just added a whole bunch of new ones to my Shelbee's Shoppe inventory. You should stop my Facebook page and check out the cute ones I have in stock! You are looking quite fabulous, my friend! I am so loving this kimono..the colors are great! You are just adorable with that little bump. So exciting to see you grow. Aren't kimonos just great, Laura?? They are such an easy topper, and at least it'll fit after the pregnancy too!!! You look fantastic!! you look so good in this komo! Definitely pulling it off in a very stylish way, loving the bump! I can't wait to hear more about your trip when you get back! This is such a pretty kimono! The kimono is so pretty on you! Love this outfit! I don't own a kimono but I love how they look. Yellow is so refreshing for summer! Such a great garment, kimonos are so versatile. They can be worn as a swimsuit cover, with shorts, jeans, black trousers... I think this one in particular is lovely and you look so pretty in it. I only own one kimono myself but I need one or two that wow me. You can do so much with them and while pregnant too they are perfect, as well for when you will nurse. You look great! Enjoy Ireland and Happy 4th! That really is an adorable kimono! And I agree, they always make a lovely layering piece. Thanks for hosting the link up! Oooh, I haven't gotten a kimono yet, but they look perfect for summer! :) Thanks for sharing your experience your first time wearing one -- it's always a good sign when strangers compliment your outfit! Have a great time in Ireland! 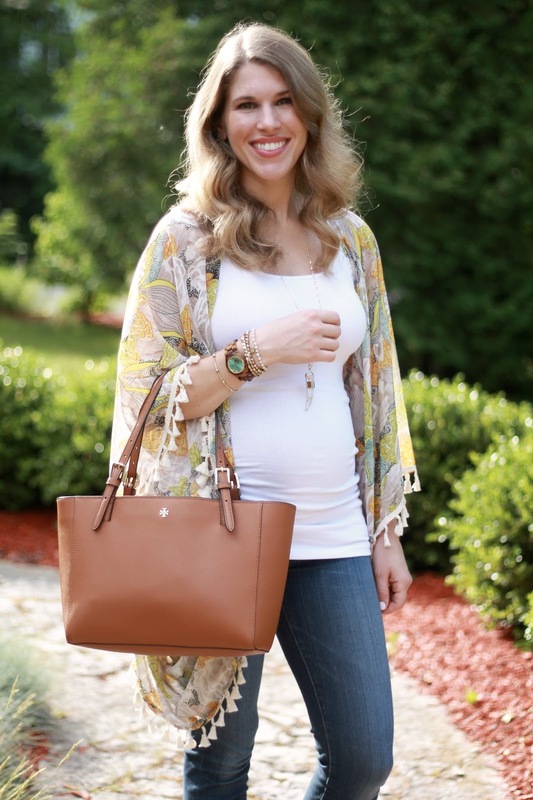 Your kimono is gorgeous and the perfect summer layering piece! Love the colors and tassels! This kimono is so cute. I love the yellow and those tassels add just the right amount details for a fun summer look. That is such a cute kimono! I love the tassel details! This is such a pretty kimono! I love wearing kimonos in the summer, as they make a perfect layering piece. Happy 4th! Good job on your first kimono! It's so pretty! That is a very lovely kimono, the tassel details are so fun! Hope you had fun celebrating the 4th abroad! Cute kimono! I still don't own one, but I really want to. Kimonos are such a great layering option for summer. I love the one you have. You and that bump are just glowing together!